Download the latest press release for thePED0828 Personal Noise Dose Meter. Download the user manual for thePED0828 Personal Noise Dose Meter. Protect yourself. Protect your employees. Make a SOUND investment in workplace Health & Safety compliance. Hearing - it's your loss. A new approach to Personal Sound Exposure Meters (PSEMs). Each Dosimeter (in the one unit) can measure DOSE according to pre-set (ISO,OSHA,NIOSH...) or your custom criteria (Exchange Rate, Level, Threshold) for World standards comparisons, in one time recording session. * Option. ** External microphone is an additional option. 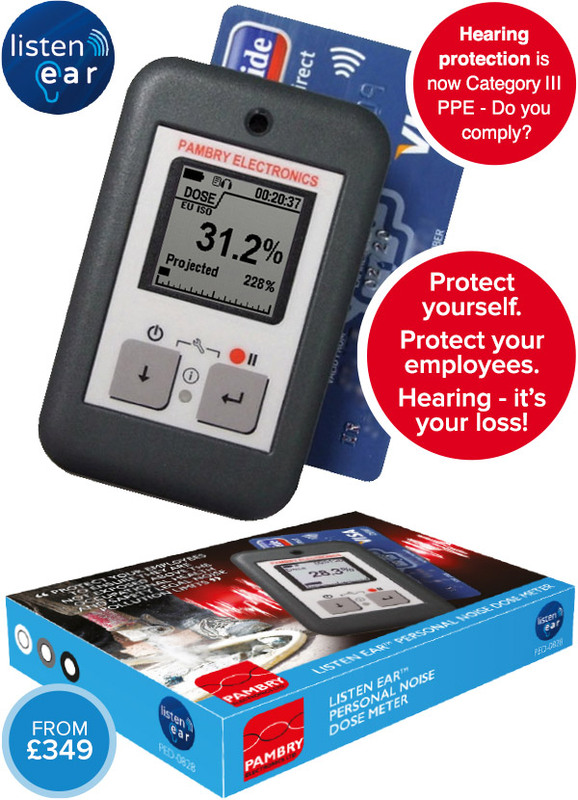 Invest in the worlds most competitve personal noise dosimeter and be compliant with workplace Health & Safety regulations. Noise Protection is now "Category III PPE" - Protect your employees to ensure they are not exposed above the occupational health and safety legal noise pollution limits. The latest PNDM Firmware version is 2.1.0. Press here to download zip file. The Pambry ListenEar Application for Android smartphone and tablet is designed to remote control the range of Pambry Electronics ListenEar Personal Noise Dose Meters / Personal Noise Dosimeters. It improves your productivity and safety by allowing you to stream measurements in real time wirelessly.